It's raining. I love rainy days -- unless, of course, we're talking about driving in LA with our notoriously aggressive/oblivious drivers, but I digress... Some of my favorite moments with my little girl have been spent outside in our raincoats and boots, (and yes, I do have pink Wellies, what of it?) stomping in puddles and dancing in the rain. The kind of moments that will warm my heart long after her pre-school years are a distant memory. Really good stuff. But when the temperature drops a bit, and the kids are in school, what I REALLY want to do is bake. Well, that or snuggle up under a warm blanket with something hot to drink, but the end result is better with the baking. This is prime citrus time here in southern California. The trees in our yard are dripping with gorgeous, sunshine-colored spheres: lemons, oranges, mandarins, grapefruit, and the gorgeous, ruddy blush of blood oranges. And Meyer lemons. If you've never tasted a Meyer lemon, they're a bit surprising. They're sweeter and less acidic than regular lemons, but they have another flavor and fragrance note, bergamot, which is heaven to some people and a little off-putting to others. (If you're an Earl Grey tea drinker, you already know the taste of bergamot, so you'll love them.) I have to admit, until recently I fell into the latter camp. But, you know what? They've grown on me. 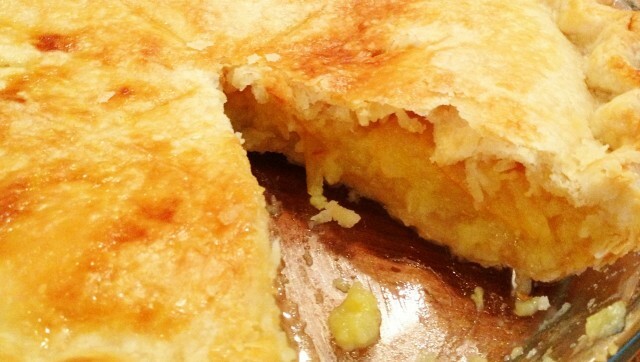 *The flavors in this pie are pretty sophisticated - kind of a marmalade/lemon curd hybrid - and since it includes the entire fruit, rind and all, the bitter notes might not appeal to kids. So, yeah, this was a selfish one. But, grownups deserve a treat too -- and my Frenchman and I loved it. Slice the Meyer lemons paper thin on a mandoline. (This is one time I really do think a mandoline is important. The thinner the slices, the less bitterness you get from the rind.) Remove the seeds, and combine the lemon slices with the sugar and salt. Mix well, then let the lemons macerate while you roll out the crust. Put half the pastry dough into a 9" pie plate, and chill in the fridge or freezer. Roll the other half of the dough between two pieces of parchment paper or wax paper to fit, than chill it before topping the pie. Add the eggs to the lemon-sugar mixture and stir well to combine. Pour into the pastry-lined pan, then top with other sheet of pastry. Crimp edges to seal, and add a few decorative cuts to vent the steam. I like to brush the tops of my pies with a little milk or cream to give it a little bit of a sheen. A sprinkling of sugar would be nice here too. Bake the pie on the lowest rack of the oven for 15 minutes; then move it to the center rack, REDUCE the heat to 375, and bake about 30 minutes more, until the crust is golden. If the crimped edges brown too fast, cover them with a bit of foil so they don't burn. Let the pie cool before cutting, to give the filling time to set a bit. My husband loved it warm, but I actually like it even more the next day.